Since our young men have graduated and are now qualified medical missionaries, I seldom have the opportunity to do the one thing I love to do—medical work. Whenever a patient comes to the clinic needing medical treatment, they jump right in and begin working before I can even get my gloves on. I am amazed at how well they have applied themselves. 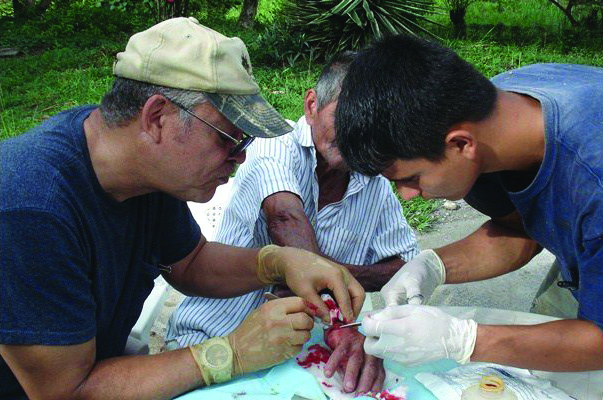 One morning, a poor fellow from high in the mountains came to the clinic, wanting to have a growth removed from his hand. I peeked out of my window and saw Roger talking to the man, so I assumed everything was under control. Moments later, Elsa came into the room to tell me that they needed my help. Hallelujah!!! I could do some medical work! As I went out to talk to the man, I was greeted by this humble, quiet gentleman (I will call him Jose). He told me he had something wrong with his hand, but did not want to go to the hospital; He had heard that we care about people and do good work. After examining Jose’s hand, I began to pray. I really wanted to help him, mainly because he was poor and could not afford proper medical treatment elsewhere; but I knew that I was not skilled or even trained to perform the operation needed. Roger and I set up the “operating room,” which actually was a plastic kitchen table, set up in our driveway. Looking at Roger, I could see him absorbing every little move I made, taking it all in. I knew that I had better not make any mistakes, because one day Roger and Rene will be on their own as gospel medical missionaries. Now came the question everyone asks—“Willis, do you numb your patients before you operate on them?” Yes, dear friends, I always use a local anesthetic on the patient. Joe Willis and Roger in deep concentration and earnest prayer as they carefully remove the growth. think Roger was excited, and I was just nervous. After what seemed like hours, I made the final cut, and out came the hard fibrous growth. Jose began to smile. He could hardly believe what he was seeing. But his smile soon changed to concern. I knew this look; it said, “Oh, no—this is going to cost a fortune.” Jose was worried that he could not afford the cost of this operation. After bandaging him up, we gave him a cool glass of vitamin water and told him to sit and rest a while. All the while, he sat staring off, as if trying to figure out how many years he would have to work to pay off this bill. I could not stand seeing him go through this. As I walked over to him, he immediately put his hand in his pocket. I quickly stopped him and told him that he did not owe us anything. However, I did ask him to bring me a batch of bananas if he had any to spare. Jose pulled out a 100 Lempira bill (about $5 U.S. dollars). It was all he had. I could not accept his money, mainly because I knew that it was God who performed this operation, not me. Jose was so grateful, he insisted on paying us something. I told him that if he really felt he must pay, that he could give the money to Roger and thank him for assisting. 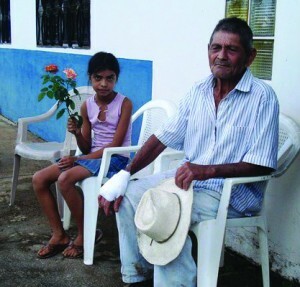 Jose and his granddaughter rest and enjoy the surroundings after the operation. Jose and his granddaughter lingered at the clinic, enjoying the peace and quiet and the beautiful flowers. As they began their long journey back up into the mountains, I assured him he was welcomed to come back whenever he needed help. I know this experience touched the heart of Jose. I know that he is a precious soul for whom Christ gave His life to save. And I believe that medical missionary work has opened the door for God’s truth to reach Jose. We must all remember that it is God who gives us true skill and talent. We can do nothing of ourselves, except fail. 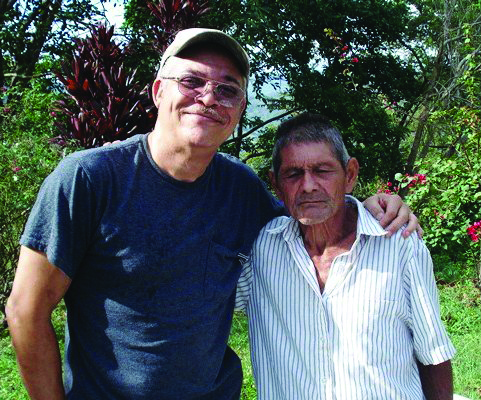 The following week, Jose returned to the clinic to show us that his hand was healing remarkably well and to thank us once again for helping him. Thank the Lord, for all He has done. “Those who love Christ will do the works of Christ. They will go forth to seek and to save that which was lost.” Healthful Living, 273. “We are not all called to occupy the desk, but we are all called to be missionaries, though perhaps in a limited sense. None can be excused. It is the duty of every one to sow the seed of truth, that it may spring up and bear fruit to the glory of God. The Lord has not given his work into the hands of a few men only; but he has given to every man his charge.” Review and Herald, April 1, 1880. “There is a great work to be done. How shall we reveal Christ? I know of no better way to reveal Him than to go forth as missionaries to our world. I know of no better way than to take hold of the medical missionary work in connection with the ministry. Wherever you go, there begin to work. Take an interest in those around you who need help and light.” General Conference Bulletin, April 23, 1901. 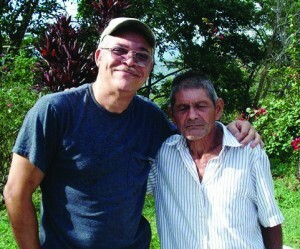 By Joe Willis, Maranatha Medical Ministries, Honduras. E-mail: mmm.mmtc@yahoo.com Website: www.maranathamedical.org. Donations can be sent to Maranatha Medical Ministries, PO Box 390, Keysville, VA 23947.